The introduction of the Android Wear platform created an new challenge for Android developers. In the Android ecosystem developers have long been considering devices with varying form factors, resolutions and screen densities. With Android wear there is now a new form factor unlike those that have come before it, the beautiful circular display that conforms to the traditional watch face and was launched with the Moto 360. This round form factor throws many curve balls when it comes to UI design, especially with a device small enough to strap to your wrist. This article explains how to dynamically encode data into a square QR code that is optimized for display on either the square or round displays found on Android Wear devices. If you are not well versed with UI design patterns for Android Wear devices, now is a good time to take a look at building shape aware layouts in the developer documentation. First a couple of words about QR codes. If you have opened this article and read this far I am assuming you are aware of what QR codes are and and how they are used. What you may not know is that QR codes are resilient, if they are partially obscured or damaged readers can often still decode them successfully. This is due to inbuilt Reed-Solomon error correction. You may have seen customized QR codes that have embedded images and a kaleidoscope of colors and shapes for the data. These work by pushing the boundaries of the error correction and you should be aware that the more changes you make to the QR code data, the more difficult it is for a QR scanner to interpret the data. This article is about generating a QR code that conforms as close as possible to the QR specification to give QR scanners the best possible chance to decode the QR code being displayed on your wearable device. Below is an example QR code with an overlay of the important elements that make up the data of a QR code. The image below shows the ideal display of a QR code running on a square wearable device emulator. Once again I will stress the importance of the quiet zone, always leave a blank section around the data. The next image shows a QR code displayed on a round wearable device. When displaying a square QR code on a round canvas you have to compromise. This does not strictly follow the QR specification as the quiet zone around the image does not match the recommended size for the complete edge of the data. It does however allow the data area of the code to be larger and this offers the best chance for a successful decoding of the QR code. For those that don’t want to read the QR specification, the size of the quiet zone should ideally be 4 times the width of the data modules (seen as thin black data lines). Now that you have seen what we are trying the achieve I will walk through generating the QR code as an image and how to display the images on each shape wearable. Generating a QR code from within any android app is quite simple thanks to the excellent library developed by Zxing. If you are using Eclipse you can import the zxing jar library. If you are using Android Studio and grade, add the following to the build.gradle for your app module. Once you have successfully added the zxing library you can generate a bitmap image in memory using the function shown below. You should note that the EncodeHintType.MARGIN allows the quiet zone of the image to be set. Passing a value of 4 as this margin will set the quiet zone to the recommended 4 times the data module size, passing 0 will create an image without any quiet zone. Now call the generateBitmap() function and then set the bitmap generated into an ImageView. Tip: Never generate the QR code on the UI thread, use an AsyncTask, or your android threading method of choice. 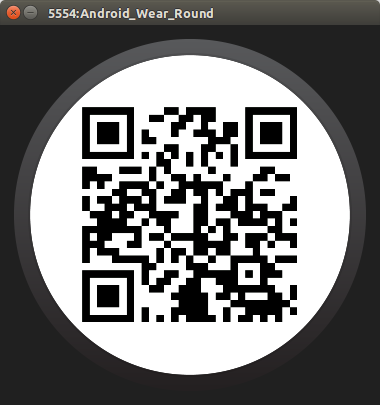 Add a layout for displaying the QR code on round wearable devices. The key items in the layout are the BoxInsetLayout and the app:layout_box="all" entry. These may be unfamiliar to developers new to Android Wear. BoxInsetLayout places its child view on round screens after applying the required window insets to be placed inside the viewable area of the device, while app:layout_box allows you to set which window insets will be applied. You could use exactly the same BoxInsetLayout on a square device and it would work as the insets would all be 0. In the example here I have used a different layout simply to show you how to specify a different layout for each device type. Here is the layout for the rectangular device with a regular relative layout as the base and the image filling the available layout. Source code for this example can be cloned from the GitHub repository below. You will need an Android Studio development environment set up and the Android Wear SDK installed. 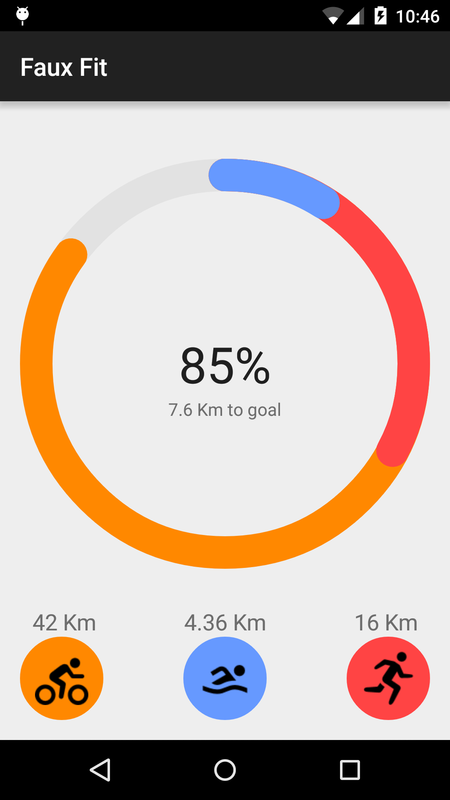 Google’s health tracking platform, Google Fit, provides data visualization using a circular view to display feedback to users. This circular view is smoothly animated and presents a variety of data about the current status of the users fitness goals. This article takes you through the steps required to build the chart shown in the clip below and add it into your Android App. DecoView was designed as a fully configurable library for animating arc based charts. Continue reading this article to find out how to reproduce the Google Fit user experience in your app with DecoView. DecoView is open source and available on GitHub. DecoView is subclassed from the Android View class. Just like other View subclasses, such as TextView and ImageView, it can be added and configured from your layout XML then controlled in your Activity code. The source code is available from the Faux Fit project on GitHub. Open your Activity layout file and add a DecoView by inserting the following declaration. Note the use of the custom:dv_lineWidth attribute to set the default width of the arcs. You can always override this value for any of the data series you add later. After adding a DecoView to your XML layout you will not see anything in your app unless you add one or more data series. The first data series we are adding is going to be used as a background track to show the path where the other data series will follow as they are animated. To add this background arc add the following code to your Activity source file. Note how we set the color to a very light gray (hex code #FFE2E2E2). Next you need to add an actual data series in your Activity code. This may be used to visualize a data value such as the number of calories the user has burnt or number of minutes spent walking. First you need to add a TextView to your XML layout. Then you can attach a new SeriesItem.SeriesItemListener() that will be called whenever the current position of the data series is changed. If you issue an event to move the series this callback will be called multiple times for the one event. We will calculate the percentage the data series is filled and update our TextView with this percentage value. Tip: When implementing the DecoView progress listeners be aware that they will be called many times for each event. Avoid heavy processing in the listener to prevent jank, and avoid new allocations to prevent memory churn. We need to set the background track to be at the maximum value, this enables it to be drawn as a complete circle. We could have set this as the initial position for the track when it was constructed, however we want to see an animation filling the background track so we use an event to reveal the background track. While it is possible to fully customize this animation we will keep it simple and just set the minimum information required; that is the position to move the value and the index of the data series to execute the event. It is possible to animate the DecoView at any time in response to a user action, such as pressing a button or using a swipe gesture. This is what we have just created with an event to be executed immediately. It is also possible to delay events to happen at a future time. We will construct then event using setDelay(5000) to delay the animation of the main data series. We need to set the current value between the minimum (0) and maximum (50) values specified on creation of the data series. Here is how to move the current position to 16.3f (out of 50) and delay the event to start after 5 seconds. After 10 seconds we will then move the position to 30. You should now have the DecoView animating and looking similar to the image below when you run your app. The code required to complete these final tasks can be viewed in the Faux Fit Activity found within the GitHub project. You should end up with an Activity something like the snapshot below. I recently completed a financial charting tool with several user controlled variables, such as interest rate, term, loan amount. One client request was on the reset to default values there should be an animation while incrementing/decrementing rather than the value jumping instantly. I decided a non-linear animation algorithm would give the best visual result by adjusting the values quickly before decelerating as the target value approached. The graph below shows the required deceleration over time. You may recognize this as a common interpolation pattern used in Android for animating movement of views. With this in mind I decided the most flexible design was to utilize the built-in Android Interpolator classes to control the rate of increment/decrement while using ValueAnimator. I have packaged the end result into an easy to use class, AnimateCounter. AnimateCounter is a simple to use class to animate a numerical count on any TextView derived object. Full source code is available here. The animation below shows an example of AnimateCounter being used to animate four TextViews from 0 to 100. Notice how the rate of numerical change for each view is influenced by the use of the different Interpolators. An AnimateCounter object is constructed using the builder design pattern. At a minimum a TextView is required for construction, then use the builder functions to optionally set initial and final values, precision, total duration and the interpolator required for animation. If no interpolator is provided the ValueAnimator default, AccelerateDecelerateInterpolator, is used. Example 1: Count from 0 to 100 in two seconds using the default AccelerateDecelerateInterpolator interpolation. Example 2: Count from 0.00 to 1.00 (floating point number with 2 decimal places) in 10 seconds using LinearInterpolator. Example 3: Perform an action after counting from 10 to 0 using the OvershootInterpolator. AccelerateDecelerateInterpolator: Slow to start and end but accelerates through the middle. AccelerateInterpolator: Starts slow before accelerating. AnticipateInterpolator: Initially backward before flinging forward. AnticipateOvershootInterpolator: Initially backward before flinging forward and overshooting above the final value before returning to the final value. BounceInterpolator: Rate of change bounces at the final value. DecelerateInterpolator: Starts quickly before decelerating. LinearInterpolator: Constant rate of change. OvershootInterpolator: Flings forward and overshoots the last value before returning. If none of the built in Interpolators fit your needs it is simple to create your own. The following class shows how to create an acceleration deceleration interpolation result. You could replace the mathematical formula in this class as required to produce your desired result. * of an animation to derive the animated value at the current elapsed animation time. * which overshoot their targets, or less than 0 for interpolators that undershoot their targets. Graphing tools can be used to visualize the interpolation algorithms and are the best place to start if you want to build our own custom interpolator. Here is an example. Step 1. Find a mathematical equation for interpolation. The following equation shows a formula used in the Android accelerate/decelerate interpolator, where time is represented by t.
The generated graph should confirm if the output from the formula is going to meet your needs. Using the above example the following graph is produced. Note the acceleration during the first half of the duration and the deceleration during the final half. Note: The process of building a native library is not covered in this article. Head to the Android NDK site for the tools and information you need to build native libraries for Android. Different Android devices use different CPU architectures, which in turn support different instruction sets. An ABI is different for each combination of CPU and instruction set. If you build with native code you need to compile that native code for each ABI that your app supports. Android supports architectures from ARM, Intel and MIPS technologies, each in 32 bit and 64 bit flavors. In figure 2, below, you can see each ABI supported along with example devices. Building a shared native library can provide significant performance increases compared with implementing the same algorithm in Java. During some basic testing to compare some similar algorithms in native code compared to Java, I found the result ranged from double to a 20 times performance increase, however it should be noted these algorithms were heavy image manipulation processing. On less intensive use cases there will be little, if any, performance benefit. The table in Figure 4 shows the effect on the file size of an Android APK that include the .so libraries for SQLCipher. The universal APK in the table is built with libraries for all the tested ABIs. For more information take a look at how to set your build.gradle file to build APKs that target different ABIs. When including native libraries you have to make a decision if you are going to ship with native libraries specifically targeting the 64 bit ABIs. Up until the start of 2015 this was an easy decision as 64 bit devices were only just hitting the market. Note: It is not mandatory to build 64 bit libraries to support 64 bit Android devices. All 64 bit ABIs are backward compatible to support native libraries built for the equivalent 32 bit ABI. This applies to ARM as well as Intel and MIPS devices. During 2015 sales of 64 bit Android devices could overtake those of 32 bit devices in some markets. If you provide native libraries specifically for 64 bit devices you should see a small performance increase with these new devices. Intel® have done some tests on Android performance using 64 bit compared to 32 bit and found performance is generally increased by 5-10%. While I have not been able to source official figures for sales figures of devices running each architecture, the breakdown is pretty clear through casual observation. ARM architectures dominate the Android device marketplace. There is a small percentage of x86 devices and virtually no MIPS devices. Notice in the table shown in Figure 5 that uploading an APK with armeabi native code will target 12 more devices than uploading an APK containing armeabi-v7a native code. The reason for this is that all devices running the armeabi-v7a are also able to execute the armeabi native code. It is possible to upload separate APKs to the play store for each ABI you are targeting. The best place to learn about this is by reading the Android documentation about Multiple APK support. Note: You should generally use multiple APKs to support different device configurations only when your APK is too large (greater than 50MB) due to the alternative resources needed for different device configurations. Using a single APK to support different configurations is always the best practice, because it makes the path for application updates simple and clear for users (and also makes your life simpler by avoiding development and publishing complexity). In the Google Play developer console you can set your app to have multiple APKs that target different devices while all being part of the one application. This means that all download counts and reviews for the different APKs still apply to the one listing in the Google Play store. All APKs you publish for the same application must have the same package name and be signed with the same certificate key. Each APK must have a different version code, specified by the android:versionCode attribute. Each APK must not exactly match the configuration support of another APK. The image below shows the Google Play website for the Android Maps app. Note how the Size for the app is listed as Varies with device. This is as a result of uploading multiple APKs for the one application. If you decide you need to deliver multiple APKs for the one app you will need to implement a version scheme for each APK. In a previous blog I have suggested extending a scheme suggested in the Android documentation, as shown below. The Google Play Developer Console allows you to upload multiple APKs for the same application through the Advanced Mode in the APK management section. Your developer console should look similar to Figure 8, below, once you have uploaded multiple APKs. Some devices are eligible to run multiple APKs. In such a scenario, the device will receive the APK with the higher version code. You may think each version uploaded is targeting a different ABI Native platform, so why is this message being shown? Remember that some ABIs can support code targeting more than one different ABI. In this example the armeabi-v7a devices also are backwards compatible to support armeabi, but the reverse is not true. With the introduction of the ART runtime came ahead-of-time (AOT) compilation to replace the Dalvik just-in-time (JIT) compilation. This is achieved on app installation when a one time process is executed to convert the APKs DEX files into a compiled app optimized for the device it is running on. Devices running the old Dalvik VM use JIT compilation that is performed at run time and only on frequently executed parts of apps. This change is designed to increase execution performance of apps on the new ART runtime. For developers AOT compilation can cause frustration as every time an app is changed it has to be reinstalled on the target device. The AOT compilation process can take anything from a second to well over 10 seconds, the more code in an app the longer the device compilation process takes. The good news is that it is possible to disable this AOT compilation for your debug builds, although this will cause your app to revert to being interpreted as it is executed. Disabling AOT compilation reduces the total time taken to deploy the app to the device and as a developer if you are modifying code and executing the app time after time, any increase in deployment speed is a welcome improvement. The tradeoff is a reduction in performance, although you are not likely to notice this performance hit for most types of applications. You should also consider that if you are writing an app that performs intensive computations then you may find saving a couple of seconds on installation for a compromised runtime performance is a counter-productive optimization. Note: It is only possible to disable AOT compilation if you have a targetSdkVersion of 22+ and you’re running a device using the ART runtime. Before you make this change you should first identify that AOT is causing a significant delay to your deployment times. For small apps it is likely that you will save less than a second of installation time and this optimization is probably not required. The device process that performs the ahead-of-time compilation is called dex2oat and outputs logging information that allows us to see the execution time elapsed. Filter your logcat for items containing dex2oat and you will see the execution time for the process. If you are seeing this option when installing your release APK then it is likely you have included vmSafeMode in your apps main AndroidManifest.apk rather than the debug only manifest. Without ahead-of-time compilation your app is going to run slower, it probably won’t be noticeable, but the runtime will have more work to do during execution. I have heard some developers have had major performance problems, such as execution of intensive processing experiencing a 10x increase in execution time. So keep an eye out for any performance problems. So far I am happy to report that I have not run into any execution issues or unexpected behavior while testing this optimization. Distributing native libraries with your APK adds complexity to your build process and can bloat the size of your APK. You have to include a specific build of native libraries for every architecture you want to target, or to be more technically correct every ABI (Application Binary Interface) you are targeting. Different Android devices use different CPU’s architecture, which have support for different instruction sets. An ABI is different for each combination of CPU and the instruction set supported. You need to make an educated and considered decision about if you distribute one APK that includes all native libraries or multiple APKs. The advantage of one universal APK is that it is simple to deploy and maintain your app, the disadvantage is that you potentially could have a substantial increase in APK size. I have previously described how to use SQLCipher in an Android app which discussed this tradeoff. Figure 1, below, shows the impact on size when shipping SQLCipher native libraries in a basic APK. The only way for a developer to distribute an app, with different APKs, to users on different devices is to have a unique versionCode and to ensure each APK is targeting different devices. The versionCode needs to be unique as it is possible that a users device is compatible with more than one APK, when this happens they will receive the version with the highest versionCode. When I mention the version I am not referring to the version that is visible to the user, which is specified as the versionName, I am talking about the internal version which is a numerical versionCode that indicates an ascending order of releases. The snippet from a build.grade script below shows the default versionCode and versionName that Android Studio will apply to a new project. It is possible that you are maintaining existing apps which only specify the version in the AndroidManifest.xml. While this works well for static version information we need to use the new Android Gradle build system to be able to dynamically generate version information. Here is an example of version information added directly into the AndroidManifest.xml. The order of the ABI numbers are important as is the length of the 8 digit versionCode. The order is based on way the Play store works with multiple APKs. Remember, if a users device is compatible with more than one APK for an application the device will receive the version with the highest version code. This is why an armeabi build will be given a prefix of 1 as this build will also be able to run a armeabi-v7a device (2) and in some cases a x86 device (8) due to a proprietary ARM translation layer called libhoudini. The versionCode we are going to generate is 8 digits long to cater for multiple APKs that differ not only by target ABI, but also different Android SDK versions and screen sizes. An example of how to incorporate all these details into the 8 digit versionCode is shown in Figure 3 below. This is an extension of a numbering scheme suggested in the Android developer documentation where we prefix the number with the ABI id value that was listed in Figure 2. You should be aware that this is only a suggested method for generating version information. It is not mandatory and it can be tailored to me your needs. For example, if you know that you are not going to distribute different APKs based on Android SDK API level then you could drop those two digits from the version. If you are distributing one APK containing all flavors of native libraries then you do not need to worry about implementing the following version scheme. To automate the version process we need to customize the build process. The build.gradle script for your app is where you can configure the build to produce a separate APK for each ABI type and also set the versionCode to conform with the desired 8 digit format discussed earlier. The splits mechanism for the Android Gradle Plugin allows you to generate multiple files as shown by the example below. You can include only the ABI types you want to build and it is also possible to build an APK that includes all possible native libraries through the command universalApk true. The section of the build script that sets the versionCode of each APK to a unique number is shown in the code snippet below. Note the project.ext.versionCodes which sets the first digit of the versionCode when multiplied by 10000000 we generate the 8 digit number we require. Finally the initial versionCode of the app, accessed with android.defaultConfig.versionCode, is added to complete the full numerical version for each APK. The Android Asset Packaging Tool (aapt) is part of the Android build tools and is required to build APK files. You can also use it to verify the contents of the APK files you have generated. This same dump can be also used to verify other attributes of your APK, such as the build SDK version, locales and supported screen densities. You will also be able to verify the targeted ABI and versionCode once you upload to the Play Store via the developer console. This article has assumed that you are distributing your app through the Google Play Store. It may be possible that you are using multiple distribution methods, such as promoting your app on the Amazon Appstore. According to the documentation the same version methodology will work for the multiple APK support within the Amazon Appstore. There are also a number of smaller app marketplaces that may automatically add your app. Each of these app store may or may not handle multiple APKs correctly which may result in some users downloading an APK that is incompatible with their device. 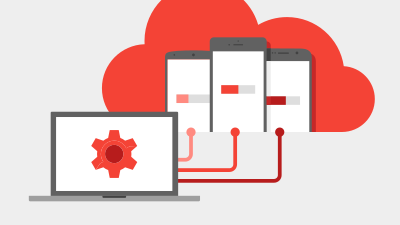 For comprehensive testing before releasing your app, Cloud Test Lab gives you access to physical devices so you can see what’s going on for your users in the real world. Plus, you can run all of your tests across all devices, all at the same time—giving you access to massively parallel testing, bringing you deep and scaled insight. Sign Up: Follow the links from your Google Play Developer Console account, as shown below. The Early Access Form is simply a few questions as shown below. You will need to have an app published though the Developer Console to apply. The Google Cloud Test Lab is based on technology from Appurify, which Google acquired back in June 2014. Appurify have some pretty awesome technology, so this is a service that is packed with potential. As this is a yet to launch service, details from Google are a bit vague at the moment. Here are a couple of important statements that give a bit more of a hint of what we can expect. Every APK submitted to Play Store’s Alpha and Beta channels will be automatically scanned on more than 20 physical devices and get a free launch performance report. Developers who want to run customized testing can eventually purchase it through Cloud Test Lab. My hope is that Google’s strategy won’t be to focus on making money directly from this venture but use the service to drive an improvement in the quality of apps. The service has the potential to make it faster and easier for developers to deal with the issues associated with the fragmentation of Android devices. I see this playing out with a subset of functionality on a subset of devices being provided for free. This will be fantastic for indie developers and small companies that do not make enough money from their apps to spend $1000’s on testing. This free functionality is likely to be the use of basic app crawlers to provide unscripted pseudo-random testing. It will probably be more advanced than letting monkey loose on the app and most likely built from the Appurify robot app crawler functionality. When do we find out more? More details and a test run of the service is still a month or two away. Stay tuned to the Cloud Test Lab site for updates. A Snackbar is a lightweight material design method for providing feedback to a user, while optionally providing an action to the user. They are displayed on the screen until a specified interval has passed, the user swipes to dismiss them, or when the user interacts with another part of the screen. Think of it as a modern take on the Android Toast. This week at Google I/O 2015 the Android Design Support Library was released including a Snackbar implementation. Before now implementing and following the material guidelines for a Snackbar was left to the developer. A few third party libraries were released to make developers lives easier, but now official support for Snackbar has been introduced to make it easier than ever to add a Snackbar to your Android app. While the Snackbar concept was introduced with the material design guidelines, the newly released Android Design Support Library works with devices right back to Android 2.1 (API 7). That is over 99% of active Android devices. Many of the design rules for Snackbars are automatically enforced by the new support library. For example, if you provide lower case text for the action button it will automatically be displayed in upper case. However you still should brush up on the exact guidelines to know the best practices and what you can and can not do with a Snackbar. Take a look at the specification for full details. In your AppCompatActivity class you need to configure the Snackbar object using the Builder design pattern. The most useful functions will be to create the Snackbar with make(), optionally set an action that the user can perform using setAction(), and finally to display the Snackbar to the user, show(). Snackbar will only work in Activities that are AppCompatActivity. If your activity extends a standard Activity or ActionBarActivity then you will need to either change your base class or use a third party implementation of a Snackbar. The result should be a Snackbar displayed on the device as shown in the image below. Note how the Snackbar in this image conforms to the specification. The text is kept short and the action text is all upper case. It is displayed on a tablet, so you will see rounded corners of 2dp and that a minimum width is enforced. The Snackbar action button should present an action related to the information being presented to the user. The most common type of actions are UNDO and RETRY. Remember in the Material Design Snackbar specification that you can only show one action on a Snackbar, and that action must be short text composed entirely of uppercase text, no icons. In the previous Snackbar example you can see that creating a View.OnClickListener() and adding it with an action is quite simple. The only work left is how you handle a click on the action button. Let’s take a look at an example, it is one of the most common use cases for a Snackbar. You have a list of items that are loaded from a database. With a swipe of the finger the user removes an item from the list and you display a Snackbar to confirm to the user that the item has been deleted and provide a action button to UNDO the delete and restore the item. There may be a temptation to think that the easiest solution here is to remove the item from the list and wait until the Snackbar has completed being displayed and then do the actual delete from the database. If the user has hit the UNDO action button then add the item back into the list and don’t do the delete from the database. The Snackbar implementation in Android does not encourage this type of implementation and in fact it doesn’t provide a callback to signal when the Snackbar view is no longer visible. The design pattern that Android wants you to follow for the example I have given is when the item is swiped from the display the item should be removed from the database immediately. You should keep the data needed to re-insert this item in the case that the user selects the UNDO action. The Material Design specification of a Snackbar only stipulates that it is shown at the bottom of the screen. The example images in the specification show the Snackbar being horizontally centered, however the default position of the Snackbar in the Android design support library is the bottom left of the device if you do not use a CoordinatorLayout (see below). It is only possible to control the position of the Snackbar if you are using a CoordinatorLayout. On smaller screen devices the Snackbar will take up the entire width of the screen, while on larger tablets sized screens the Snackbar will hit the maximum allowed width and not take up the entire width of the device. When using many of the new elements introduced in the support library you will need to get to know the CoordinatorLayout. CoordinatorLayout is a ViewGroup derived component that allows you to specify behaviors for child views to control how they interact with one another. If you recall one of the design rules for Snackbars was that they should not block the floating action button (FAB). With the newly released FloatingActionButton class blocking of the button is prevented by controlling the behaviors of the child views in the CoordinatorLayout. By using a CoordinatorLayout you are also able to add padding or margins in order to move the Snackbar display position from the bottom of the screen. Swipe to dismiss functionality is baked into the new Snackbar class when used in conjunction with a CoordinatorLayout. If you are finding that swiping on your Snackbar has no effect then check the type of View you are passing to the Snackbar.make() function. You don’t have to pass the CoordinatorLayout directly, passing a child view of a CoordinatorLayout is sufficient. The Snackbar is not designed to be displayed indefinitely, but you are able to set the duration it is displayed before it is once again animated to hide it from the interface. There are two standard lengths Snackbar.LENGTH_LONG, which is currently 2750 ms and Snackbar.LENGTH_SHORT which is currently 1500ms. It is possible to pass a custom display length in ms to the Snackbar.setDuration(int) function, and with the 22.2.1 release Snackbar.LENGTH_INDEFINITE is also a valid argument. You are able to add color combinations to the Snackbar text using the SpannableStringBuilder class. Using this class is also an alternative method for applying formatting such as bold to the Snackbar text. In the case of a Snackbar minimizing your text length is vital. Be succinct when writing text on the Snackbar, especially the action text. While the text must contain enough information that the user understands the meaning, it can’t be so verbose that layout problems are caused on small devices. Ensure you test the layout of the text on a range of devices. While your text may look good on your shiny new 10″ tablet, spare a thought for those on the smallest devices your app is targeting. If it is a possibility that you may localize your app in the future then think about the size of the text now to prevent more work down the track. Consider doing some pseudo-localization testing for your app, remembering that this text could possibly be twice as long after being translated from your apps native language. 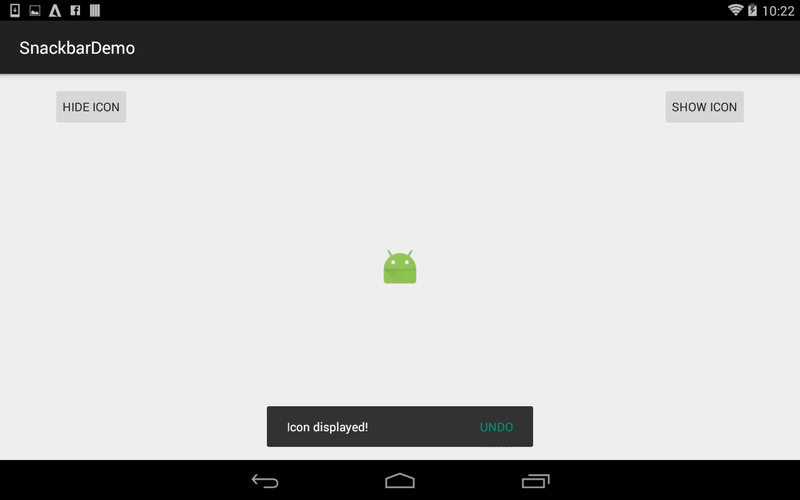 I have previously blogged about how to test localization using pseudo-localization on Android.